Trochanteric fractures are common in elderly patients with osteoporosis and are surgically treated to facilitate early rehabilitation and to prevent lodging-related comorbidities. Nonunion and hardware breakage of intertrochanteric hip fractures is a relatively rare occurrence resulting from an incorrect surgical procedure. We present a case of ZNN nail breakage caused by fatigue of an unstable trochanteric fracture in a very active elderly female. 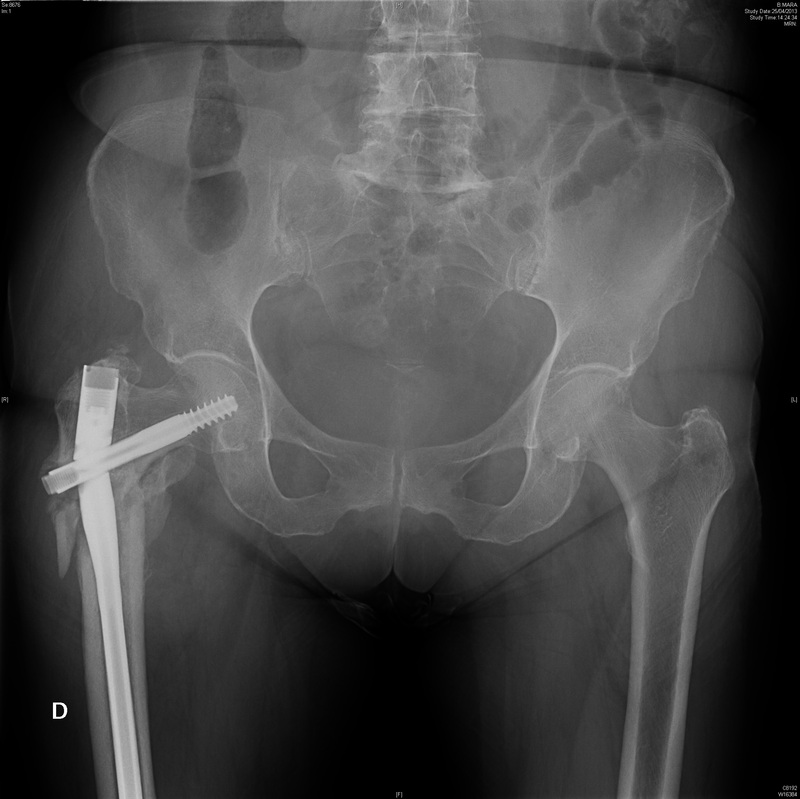 An 84 year-old woman was treated with a long, pertrochanteric femoral nail. Six months after surgery, she returned to the emergency department due to the ruptured nail. The patient underwent hemiarthroplasty with a stem revision and, after removing the nail, was stabilized with a trochanteric gripping plate and rims. Long-term results assessed with the Harris Hip Score and the Oxford Hip Score were excellent. The patient’s quality of life improved greatly. Our experience confirms that total hip hemiarthroplasty is a satisfactory revision procedure after failed treatment of an intertrochanteric fracture in elderly patients with poor bone stock and high functional demands in daily activities.